The 32-year-old attacked Rashid from the start and it paid rich dividends. He never allowed the bowler to settle on a pitch which did not offer much help spinners. 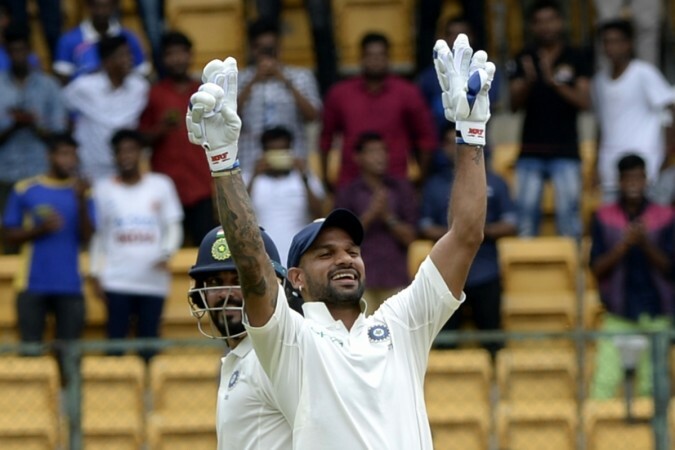 India opener Shikhar Dhawan today (June 14) revealed how he had an "advantage" over Afghanistan's star spinner Rashid Khan on the inaugural day of the historic Test between the sides in Bengaluru. Left-handed Dhawan was in dominating form as he smashed a record-setting 96-ball 107 at the M. Chinnaswamy Stadium on Thursday. The hosts ended the rain-hit day at 347/6 in 78 overs with Dhawan's opening partner Murali Vijay (105) to scoring a ton. Dhawan became the first Indian to score a hundred before lunch on the opening day of a Test match. Overall, he is the sixth in the world to achieve this rare feat. The previous best for India was 99 not out by Virender Sehwag against West Indies in 2006. Dhawan brought up his seventh Test hundred off just 87 balls. He went to lunch at 104 not out off 91 balls with 19 fours and three sixes. After the break, he could add only three runs before falling to paceman Yamin Ahmadzai, caught by Mohammad Nabi. According to Dhawan, he went "with the flow" and never planned to attack Rashid in the Test. He, however, said playing for the same franchise – Sunrisers Hyderabad (SRH) in the Indian Premier League (IPL) helped him immensely to tackle the Afghan youngster. "Of course, Rashid is a top-class bowler and I enjoyed my battles with him. Since I dominated I enjoyed it but as I said, he is a great bowler. I just went with the flow. The good thing is that one advantage that I had (was) I faced him in nets for two years because we play for the same team (SRH) in the IPL. So, I was used to his bowling and that helped me," Dhawan said after the end of day's play. Rashid was one of the stars of IPL 2018. He bamboozled the batsmen in the shortest format of the game and batting legend Sachin Tendulkar had hailed him "best spinner in the world" in T20s. However, the 19-year-old found it tough on his first day as a Test cricketer. He was taken for plenty by Dhawan and only bounced back in the final session of play, dismissing Indian captain Ajinkya Rahane. He ended Day 1 with figures of 1/120 in 26 overs. He conceded 17 fours and a six. Dhawan also said he was not aware of his record and came to know only later through television. "Yeah, it feels great. Of course, I didn't know that nobody (Indian) has scored 100 in a session (before lunch) and once I came back I read the thing on TV and was grateful about it," he said. This is Afghanistan's first-ever Test. They were granted Test status, along with Ireland, by the International Cricket Council (ICC) in June 2017.